Knowing how to interpret graphs can help us make sense of the world around us. In our working life it has become a crucial skill, in factories graphs monitor production. In Business they use graphs to analyse their performance, even in music composing programs graphs are used to show music variations. In hospitals the inablitity to read graphs that are displayed on monitors can be dangerous. In which years did Roy collect data? How many kestrels did he see in the first year? We find the answer on the y-axis: approximately 500, it shows there were a few more mice than kestrels. What happened in the next 2 years? The green line increases which means the number of mice rose, the blue line fell which means the number of kestrels decreased. Did the trend of the first years continue? No. There has been a change in 1954. Since then there were more kestrels than mice. Now look at these 2 graphs about mice and kestrels. They look very different from the first one. What stories do they tell us? 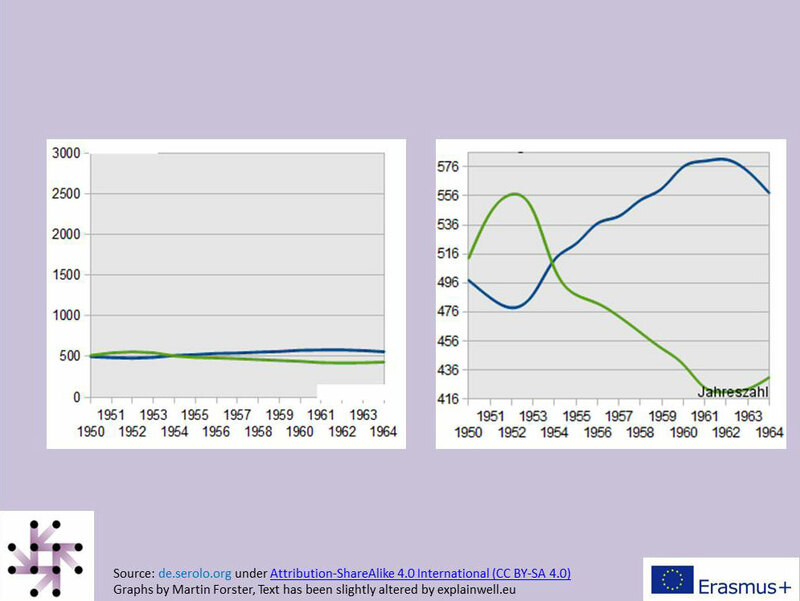 What story does the left graph tell? The left graph tells you that the numbers of mice and kestrels are nearly the same and do not change much over the years. The graph emphasizes the stability of numbers of mice and kestrels. What story does the right graph tell? The one on the right tells you that the numbers of mice and kestrels change drastically over time. 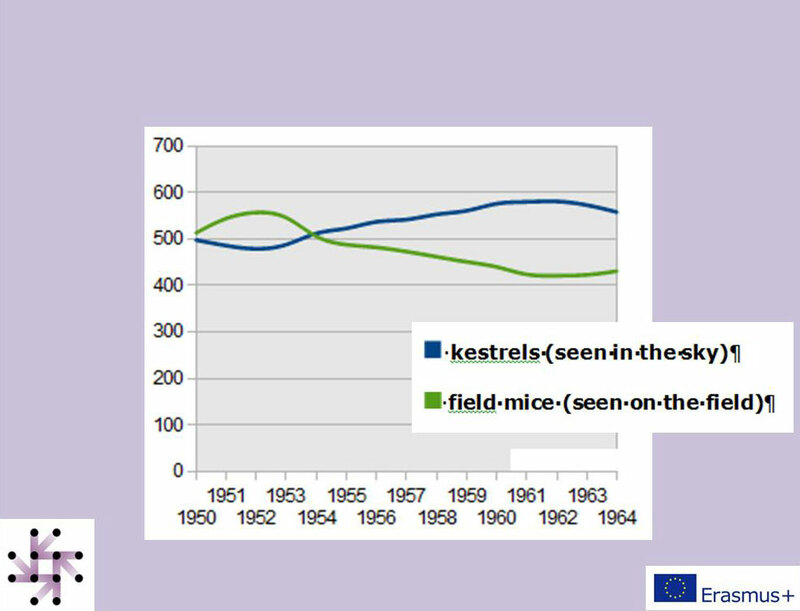 The graph emphasizes the change and drop of field mice over the years and the increase of kestrels. But why are they so different even though they are based on the same data? What is the truth? Remember the following sentence: „Never trust a diagram that you have not faked yourself.” It sounds like a joke but there is a lot of truth in in. How you can interpret a diagram truthfully, you can learn in the next chapter. Here you can view a video tutorial as introduction on reading an interpreting a line graph.